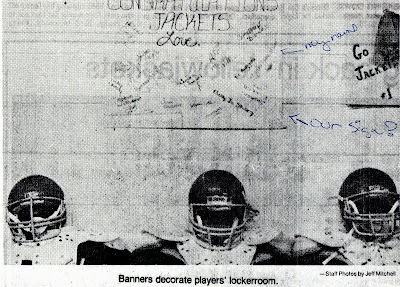 We've now read all 12 of Andy Mayberry's articles re-capping the 1987 SHS Football season. But let's go back a little bit farther... to 1986, at the front end of what would be one of the greatest turn-arounds in high school history. Thanks to Becky Millard ('87) for this article. The video tape Don Campbell showed his Sheridan Yellowjackets before their practice Monday began with a spectacular scene. It was the video tape of their victory Friday over Fordyce, and it began with a shot of the mob outside the Fordyce ticket booth. 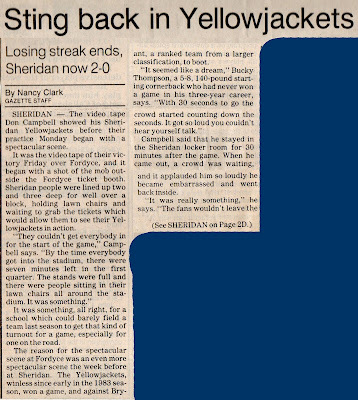 Sheridan people were lined up two and three deep for well over a block, holding lawn chairs and waiting to grab the tickets which would allow them to see their Yellowjackets in action. It was something, all right, for a school which could barely field a team last season to get that kind of turnout for a game, especially for one on the road. The reason for the spectacular scene at Fordyce was an even more spectacular scene the week before at Sheridan. The Yellowjackets, winless since early in the 1983 season, won a game, and against Bryant, a ranked team from a larger classification, to boot. Campbell said that he stayed in the Sheridan locker room for 30 minutes after the game. When he came out, a crowd was waiting, and it applauded him so loudly he became embarrassed and went back inside. Donnie Dillard, a senior starting offensive right tackle who hadn’t won a game since he was in junior high, was simply stunned. 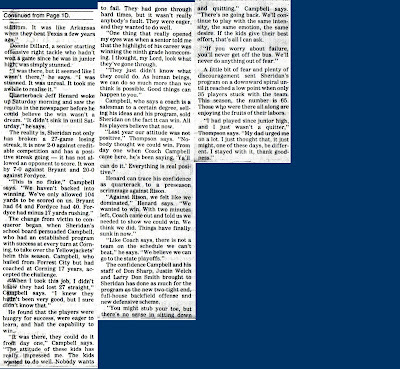 Quarterback Jeff Henard woke up Saturday morning and saw the results in the newspaper before he could believe the win wasn’t a dream. “It didn’t sink in until Saturday,” he says. The reality is, Sheridan not only has broken a 27-game losing streak, it is now 2-0 against creditable competition and has a positive streak going – it has not allowed an opponent to score. It won by 7-0 against Bryant and 20-0 against Fordyce. The change from victim to conqueror began when Sheridan’s school board persuaded Campbell, who had an established program with success at every turn at Corning, to take over the Yellowjackets’ helm this season. Campbell, who hailed from Forrest City but had coached at Corning 17 years, accepted the challenge. He found that the players were hungry for success, were eager to learn, and had the capability to win. “It was there, they could do it from day one,” Campbell says. “The attitude of these kids has really impressed me. The kids wanted to do well. Nobody wants to fail. They had gone through hard times, but it wasn’t really anybody’s fault. They were eager, and they wanted to do well. “One thing that really opened my eyes was when a senior told me that the highlight of his career was winning the ninth grade homecoming. I thought, my Lord, look what they’ve gone through. “They just didn’t know what they could do. As human beings, we can do so much more than we think is possible. Good things can happen to you.”Campbell, who says a coach is a salesman to a certain degree, selling his ideas and his program, sold Sheridan on the fact it can win. All his players believe that now. Henard can trace his confidence as quarterback to a preseason scrimmage against Rison. The confidence Campbell and his staff of Don Sharp, Justin Welch and Larry Don Smith brought to Sheridan has done as much for the program as the new two-tight end, full-house backfield offense and new defensive scheme. “You might stub your toe, but there’s no sense in sitting down and quitting,” Campbell says. “There’s no going back. We’ll continue to play with the same intensity, the same emotion, the same desire. If the kids give their best effort, that’s all I can ask. A little bit of fear and plenty of discouragement sent Sheridan’s program on a downward spiral until it reached a low point when only 35 players stuck with the team. This season, the number is 65. 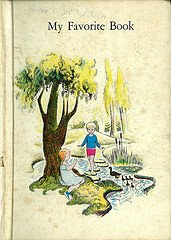 Those who were there all along are enjoying the fruits of their labors.